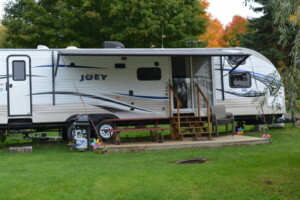 We have six rental campers available for your family. Most of our campers sleep six people comfortably. Our campers have a queen bed, bunks, A/C and heat, kitchen, bathroom, gas grill, picnic table, fire pit, and parking for one vehicle. We supply all linens and cooking supplies. All you have to bring is clothing and food! *Please click the book now button to see the rates for your dates.